Over the last couple of years I have been building some ferrite magnet alternators. This is partly due to the sharp increase in neo magnet pricing a few years back and also the problems I have seen with neo magnets corroding. Ferrite magnets absolutely cannot corrode and the old ferrite alternator machines that I built 10-15 years back have not had problems with their magnet rotors. I have focused on 2 metre and 3 metre blade diameters for the ferrite projects that I have done recently, and I call them 2F and 3F for short. I have good performance data from a 2F machine here on Scoraig, and it’s efficiency has been great whilst it has also completed 18 months of service without any teething troubles at all. 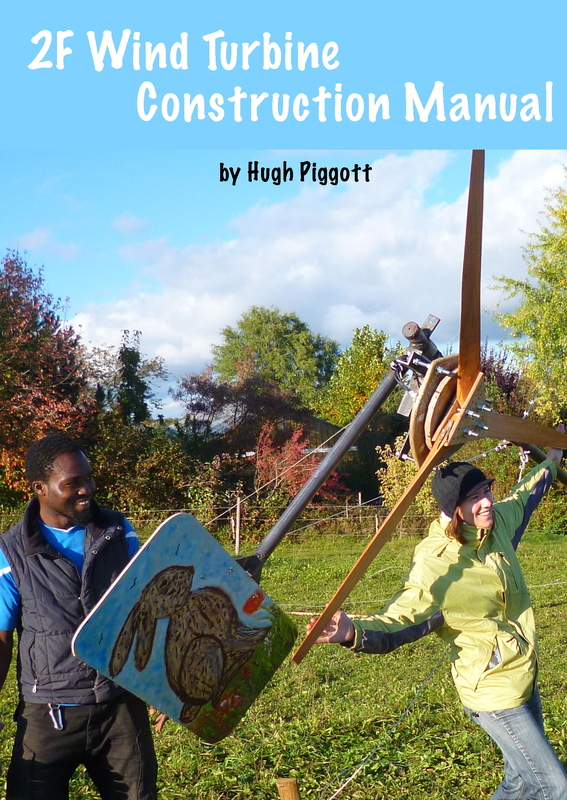 It has taken me a while to finalise my documentation of the 2F design but I have now uploaded an ebook to Smashwords, and hope that in time they will distribute it to Amazon etc. Meantime you can buy it in any digital format you like directly from Smashwords. I plan to also print some paper copies and offer them for sale in due course. I apologise for not giving this information away for free. Enterprising readers will presumably find a way to steal it anyway. But bear in mind if/when you do this that I have put untold hours of loving work into preparing this document. Hours that I could have spent doing something rather better paid. I have received abusive messages saying I should not be charging money for this, but given that the price of the book is less than almost any item in the list of materials you will need to build it, I feel that my pricing is not unreasonable. 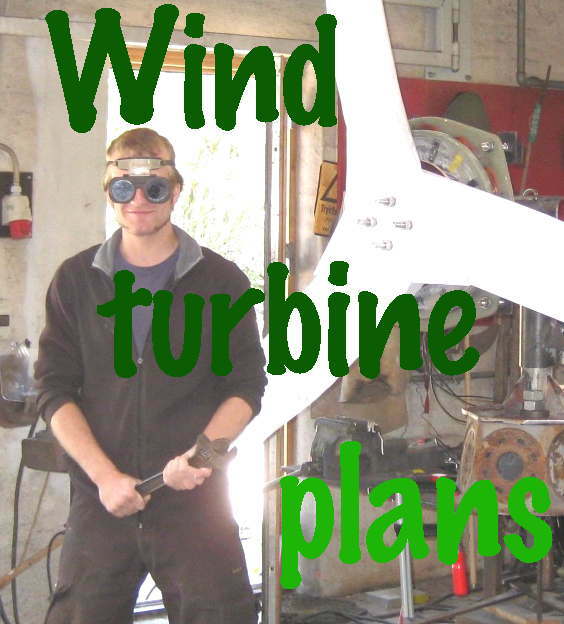 I just got your 2F win turbine ebook. I love it and i am getting ready to start my first Wind Turbine, I am located in Haiti and i could only find magnets in the USA> I wanted to know if we could use the 2 x 2 x 1 inches ceramic magnets for the 2F project? Icould also get 2 x 2 x 1\2. Witch one do you sugest for the 2F win turbine @ 24 volts. I have used the 1 inch thick magnets and they work well. The half inch ones would not be so good. The blades would run rather fast and you would not get so much power in low winds. I suggest you get the one inch thick magnets. Thank you Sir for your prompt answer! I am very interested in these 2f type turbines for the durability of the rotor magnets, having built and run a 5 blade 1m turbine as designed by joulain clement. I was wondering if there is a 1.2m diameter design described in the book, or if it would be fairly straightforward to come up with that size from the information in the 2f book. My location wouldn’t allow for a bigger turbine unfortunately. Seems to me that you could use 8 50×50 ferrites on each of two disks and build a suitable alternator for a 1.2F. It would be rather heavy, but quite efficient. if you are interested I could send you some details and I’d be interested to learn how you get on. You’d need to tell me the battery voltage required. That sounds fantastic, I’ve ordered the 2F book now (I have the recipe book). The battery voltage is 12v, there would be a diversion load to hot water and we hope to use fairly good pwm dc/dc converter control to keep the turbine in a good state. We are building two turbines here, and probably another quite soon so I would be happy to build to any specifications you come up with. We have good ish test equipment too so could let you know on performance. The joulain clément turbine had no furling mechanism actually, would you include one here? We had also planned to at least rough out or mark out the blades using our semi automatic cnc machine, and so we are looking forward to seeing the simplified blade build. Any thoughts are welcome! Joulain clément uses a scooter bearing, which is just a flanged pipe with two standard bearings in. You mention weight, but I find this bearing setup very handy and nippy if you think it would be up to it. Thank you yet again for your, time, help and patience. It is wonderful to have a person to contact for good free practical advice. It is now “think time” as I get my thoughts together. Any progress on the turbine? I can recommend Jimmy and Miriam at Eirbyte in Leitrim. I have worked with them and I like the way they do things. 1. If I build an off grid 2F turbine, which I understand stores generated powers in a battery bank, can I utilise this power in the grid system (I am linked to the national grid) and if so how? If not how can I use the power generated? 2. If I build a grid linked turbine how do I link it to the grid system? My sincere thanks for your help and aware that you must be a very busy man, I will endeavour not to trouble you further unless absolutely necessary. You would use an inverter to create AC power from your battery. There are many sizes and qualities of inverters to suit different needs, but often something rated at about 3kW nominal power sine wave is ideal for running a house. this will be able to meet a peak demand that is roughly double the rated power. If you are on the grid then you probably do not need batteries. You can use a grid tied “wind inverter” to connect the turbine to the grid. You will need to use software to program a “curve” into the inverter so it works with the turbine. You will also need to have some protection against damage from over-voltage in the event that the turbine runs unloaded (before the inverter starts to draw power from it). This is usually in the form of a voltage “regulator or limiter” with an associated load resistor that loads the turbine at those times. Ginlong make suitable products. ABB also. SMA not any more. Cheap low wattage ones are available that are not certified. If anyone is actually doing this, then ask me for suitable winding details and a suitable curve. I will expect you to carry it out and report back. I also have plans available in draft format for larger 3F 4F and 5F turbines. I have not had time or incentive to formally publish these but some people are building them. I purchased “Wind Power Workshop:Building Your Own Wind Turbine” some 15 years ago but never got around to building it. The idea has resurfaced now that I have the time but I would now prefer to go for the 2F Wind Turbine in view of the benefit of the ferrite magnets as mentioned by you. I live on the west coast of Ireland so wind is certainly not a problem, but before I purchase the book and make a start, I admit a preference for the VAWT. Is it possible to adapt the 2F to a vertical axis system and if so have you any preference as to design type. I greatly appreciate all of your help as conveyed both on your web site and answers to questions posed. I have attitude to Verticals so you might do well to get advice elsewhere. But if you can tell me the power it can produce versus the rpm at which it would spin then I can always design you an alternator. Designed plenty for verticals but it’s a waste of time for everyone I must say. I have sent you an email now. Please can you tell me what size the magnets are? You say 2” x 1”, but then later you say 2” x 2” x 1/2”. Is this correct? dear sir,i bought some ferrite magnets here in our country,size is 2″x1″x1/2″.i planned to build one of your projects,how can i buy your book,thank you. I am afraid that I do not have any books describing how to use that size of magnet. I mostly work with bigger ones. 2 x 2 x 3/4″ for example is good for the 2F design. hi sir,the 2003 edition,you mention the size of magnet 2x1x1/2″,but the difference is neodymium,will the ferrite do the work? No it’s not the same as NdFeB or neodymium at all. It will not work, sorry. If you use them then I suggest you put them much closer together like in the 4F design and pack them in to maximise flux. That approach works but you do need a heavier alternator than you would build with neo for the same output at the same speed. thank you sir for the advice,but now,the available size of magnet here is 2”x2”x1/2″. OK well you could try out a new design with 12 magnets on each disk (24 magnets in total) and 18 coils. Are you working in metric or inches? I don’t know where you are to be honest. You never told me that. I can suggest a design for you if you want. I purchased the 2F e book a couple of weeks ago and I am looking for compatible ferrite magnets here in the US and the close as I could find is 2″ long x 2″ wide x 1″ thick (50.8mm x 50.8mm x 25.4mm). Will these work with your 2F design? Yes I have been to the states (in 2012) and I have built a 2F with these 2x2x1 inch magnets. It works very nicely. Great pics from the workshop. A few familiar faces. I am a 2008 SEI alumni (mostly solar) and wind workshops with Mr. Mick S at MREA in Wisconsin. Will you be in the US for a workshop soon? I have purchased the magnets and now I am trying to source the enamelled copper wire and again struggling to convert metric to the antiquated AWG. When you reference 1.6mm is this 14AWG and 1.15mm is 17AWGI, correct? The mm2 throws me off. Sorry but I am not doing workshops these days but you can do one with Dan Bartmann in March. He is very good. Your books and plans have always been well worth the cost and have been a wealth of information for me over the years. Keep up the great work. have I missed something, or the diameter of wire is missing for 12 and 24v ? I only see the number of turns for the above voltages, but for 48v you recommend thinner wire and wrote the diameter. hi pedro, yes you did miss the wire size. It is in the table at the beginning of the section. 1.6mm diameter. But thanks! If you missed it then so will others. The good thing about ebooks is that this sort of thing can be fixed quickly. Good luck with the book nice to see you producing a new one. Nice Hugh and Congratulations on your latest publications. I look forward to buying a printed version real soon. Nice to see you going the ferrous magnet route.